A silhouette of graceful curves and modern lines whisper understated elegance for any setting. Built around a solid wood frame, the midnight sofa features a deep seat and low back cushion for supreme comfort, accented with rich midnight blue or luxurious blush velvet fabric. Subtle elevation reveals a studded polished copper plinth. Costumer own fabric selection available upon request. 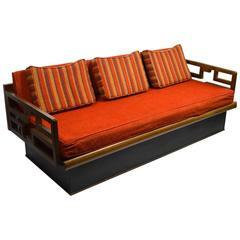 Chic Asia modern Mid-Century sofa with open work arms on plinth base. This sofa is a nice usable size, clean, original and comfortable. Design after Adrian Pearsall.